A scientific publication written by a group of Unimore researchers has been rated one of the best 20 articles of 2018 among those published by the international journal Wires Nanomedicine and Nanobiotechnology. 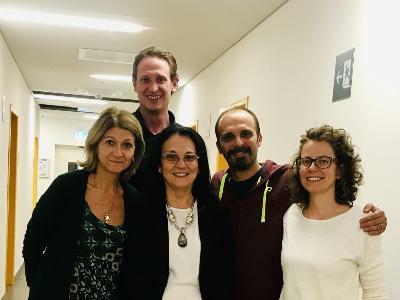 The authors are Francesca Pederzoli, Giovanni Tosi, Maria Angela Vandelli, Daniela Belletti, Flavio Forni and Barbara Ruozi of the Te.Far.T.I. Centre. (Research centre on traditional and innovative technologies) of Unimore, which for years has been dealing with Nanomedicine and drug delivery. The article  Protein corona and nanoparticles: how can we investigate on? , published last year on the famous US journal, which is very popular in the university environments all over the world, deals with Nanomedicine, one of the development areas in the medical and technological field for the targeted care of difficult treatment pathologies, exploiting the use of nanocarriers to deliver drugs to diseased cells and tissues. The specific feature of this work is the study of Protein Corona, that is the set al all proteins to be absorbed on the surface of nanocarriers, once they get into the bloodstream and must be identified as they are the true biologic identity. Therefore, the study is essential to understand what happens to nanocarriers, by identifying which proteins are present on the surface of such nanomedicines, which ones may affect the therapeutic response and which ones may possibly cause adverse reactions. This is a highly topical aspect. As a matter of fact, recently the same research group was awarded a project financed by Regione Emilia Romagna, focused on the analysis and identification of these proteins, in order to ensure not only the effectiveness of treatments, but also their total safety. As the project coordinator, professor Barbara Ruozi of Unimore states, The study is simply the first step to best understand nanomedicines and their real application. You need to understand that if nanomedicines are to be part of the future of medical therapy, one of the most important aspects is to meet the standard of effectiveness and safety at the same time, minimizing the adverse reactions. Professor Giovanni Tosi, who is also of Unimore and a scientific delegate for Nanomedicine, adds that This aspect is essential to the development of Nanomedicine and perfectly integrates in the European research lines, of which Unimore is already a stable part thanks to the projects that are carried out in the different laboratories belonging to the internal platform, and as a member of the European platform on Nanomedicine. It is a university research centre of the Department of Life Science that groups together teaching staff and researchers of Unimore, skilled both in research and development of Traditional and Innovative Pharmaceutical Technologies. Integrating documented skills in different scientific fields is a focal point in the design and development of a pharmaceutical form. Te.Far.T.I. aims to be an advanced reference point in the field of pharmaceutic technology, and is especially active in the delivery and directional positioning of active substances to target tissues and cells, focusing on the diseases of the Central Nervous System and cancer. The centre boasts active partnerships with national and international companies (Chiesi, Opocrin, Biofer, Pharmanutra, Sanofi, Pfitzer etc..), with national research institutions (Istituto superiore di Sanità, Istituto Farmacologico Mario Negri), with universities and hospitals, confirming the cross-disciplinary nature of its research. The picture shows the group of researchers from Modena working in the Tefarti Centre.